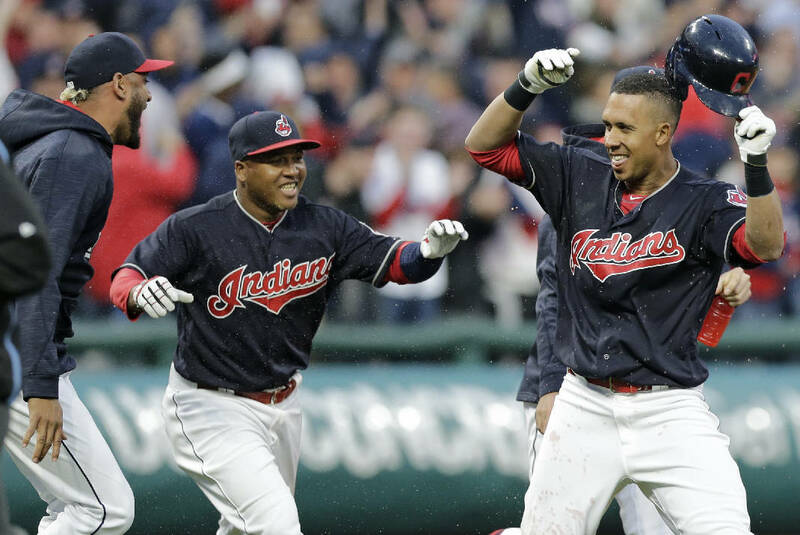 CLEVELAND (AP) - Michael Brantley doubled home Francisco Lindor with two outs in the 10th inning as the Cleveland Indians celebrated their 2016 AL championship and then beat the Chicago White Sox 2-1 on Tuesday in their home opener. Brantley could only watch and cheer for his teammates last October during their postseason run after undergoing two surgeries on his right shoulder. But he's healthy now, and after playing in just 11 games last season, Brantley made the most of his first home game since May 10 with his game-winning hit. Lindor walked with two outs off Tommy Kahnle (0-1) before Brantley sliced a 3-2 pitch down the left-field line. Lindor was running on the pitch and scored easily while Brantley danced around second base before being mobbed by his teammates. It was the dramatic ending the Indians didn't get in their last home game, a 10-inning loss to the Chicago Cubs in Game 7 of the World Series. Cleveland led the majors with 11 walk-off wins last season. Bryan Shaw (1-0), who took the loss when the Cubs won their first title in 108 years, got the win. Lindor homered in the first and the Indians missed a couple late scoring chances as newly signed slugger Edwin Encarnacion twice grounded into inning-ending double plays with the bases loaded. Todd Frazier homered for the White Sox. On a day of reflection and inspiration, injured Indians second baseman Jason Kipnis thought it was important to remember what happened last season. "As soon as the first pitch is thrown, the page is turned," he said. "But one peek into the yearbook isn't going to hurt." Carlos Carrasco, who also missed the Indians' postseason run with a broken right hand, allowed just one run and four hits in seven innings. It was his first start at home since Sept. 17, when he was struck by a line drive hit by Detroit's Ian Kinsler. Frazier came in batting just .059 (1 for 17) and without an extra-base hit before doubling in the second inning and then tying it in the fifth with his homer off Carrasco. Lindor received the loudest ovation of any Cleveland player during pregame ceremonies, when an AL title flag was hoisted and the club's first pennant since 1997 was unveiled. Indians fans roared again when the 23-year-old All-Star shortstop homered in his first home at-bat of 2017, connecting on a 2-1 pitch from James Shields. White Sox: LHP Carlos Rodon (bursitis in left biceps) is playing catch in Arizona but has yet to throw off the mound and there's no definitive timetable on when he'll join the club. He went 9-10 in 28 starts last season. Indians: Kipnis is making progress as he deals with inflammation in his right shoulder. The Indians intend to have him play in three straight minor league games - possibly one as a DH - this week before he is re-evaluated. Kipnis took grounders and threw to first before the game. ... RF Lonnie Chisenhall is poised to come off the 10-day disabled list. Chisenhall injured his right shoulder crashing into the outfield wall on March 24. He'll likely be activated for Thursday's series finale. White Sox: LHP Derek Holland is 0-3 with a 5.74 ERA in his past three road starts. Indians: RHP Danny Salazar will be pitching on six days' rest after getting a no-decision in his first start. Salazar has a 5-2 career record against the White Sox.